On 23 October 2012 the Treatment Action Campaign (TAC) and Médecins Sans Frontières (MSF) hosted a meeting to examine intellectual property in South Africa from a public health perspective. The meeting explored the challenges posed by excessive pharmaceutical patenting in the country and the limitations in South Africa’s patent law, which does not utilize many of the flexibilities that promote access to affordable medicines. A key focus of the meeting was the opportunity provided by the Intellectual Property Policy for South Africa to improve our laws to protect health and strengthen development. The Intellectual Property Policy is currently under development by the Department of Trade and Industry (DTI). Mr MacDonald Netshitenzhe, Chief Director of Policy and Legislation at the DTI, informed the meeting that the Intellectual Property Policy will be submitted to Cabinet on 5 December 2012. 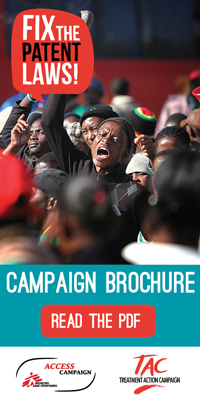 Following which, a three month period of public consultation will commence in either December 2012 or January 2013. The policy will be presented to Cabinet for final approval in March or April 2013. Netshitenzhe said that the “IP Policy and legislative review or reform may contribute to access to public health if done appropriately”, adding “TRIPS says we can use flexibilities”. TAC and MSF welcome this announcement and the opportunity to engage publicly on the policy and subsequent amendments to legislation, to ensure that public health is promoted and protected, as enshrined in Section 27 of the Constitution of South Africa. Netshitenzhe told the meeting that government is undertaking a regulatory impact assessment on the policy. Few details were provided on this assessment and it is not clear whether it will be published for public scrutiny. Such assessments can be complicated and it is therefore essential that the assessment is published, so that all stakeholders can analyse the methodology. Netshitenzhe said that to date the DTI had carried out ‘targeted consultations’ regarding the policy with legal representatives of the pharmaceutical industry and other government departments. The Department of Health, represented by Dr Anban Pillay, was invited to present on the department’s needs and expectations for the IP policy. Dr Pillay said that South Africa is granting patents on products that do not provide added benefits to patients. He also emphasised that South Africa has room to amend its laws to better protect health. Yousuf Vawda, an attorney of the High Court and Professor of Law at the University of KwaZulu-Natal, argued that, as it currently stands, intellectual property legislation in South Africa is inconsistent with the Constitution. Vawda outlined the amendments that South Africa can make to remedy this. 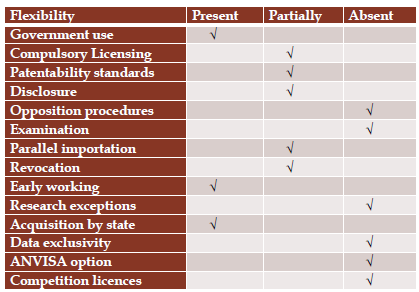 The table below is a ‘Flexibility Scorecard’ that Professor Vawda presented during the meeting. The scorecard shows which of the flexibilities allowed in the Agreement on Trade Related Aspects of Intellectual Property Rights, or TRIPS Agreement, to protect health are not provided for in South Africa’s legislation. Where Vawda has ticked partially or absent in the scorecard, it indicates that government has room to amend South Africa’s laws to better protect health. Further, government has a Constitutional obligation to make these amendments. 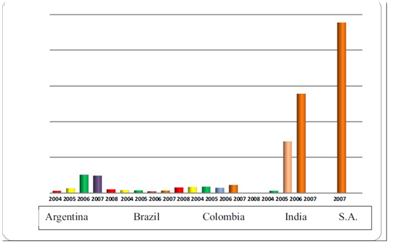 Professor Vawda demonstrated that as a result of South Africa’s failure to adopt or fully work these flexibilities, South Africa grants an excessive number of patents when compared to countries with similar levels of development (see graph below). Bhaven Sampat, Associate Professor at Columbia University’s Department of Health Policy and Management, presented findings from new research showing that South Africa not only provides an excessive number of patents when compared to other developing countries, but also in comparison to the US and the EU. It is noteworthy that South Africa is upholding many patents that have been rejected by developed countries with notoriously strict intellectual property protection and weak patentability standards. Data in the table above was compiled by Bhaven Sampat, Amy Kapczynski, Professor at Yale Law School and Chan Park, General Counsel and Interim Executive Director for the Medicine Patent Pool. The table compares identical patent applications that were filed in South African Patent Office (CIPC), the U.S. Patent and Trademark Office (USPTO) and the European Patent Office (EPO) via the Patent Cooperation Treaty (PCT). A number of speakers said that excessive patenting in South Africa was largely due to the fact that patents are granted in South Africa without undergoing examination. As such, patents are commonly granted which fail to meet South Africa’s patentability standards. Furthermore, while South Africa grants many patents that fail to meet the countries patent standards, the low levels of patent litigation indicate that litigation is an inadequate remedy to combating invalid patents. Between 2003 and 2008, only seven challenges on the validity of patents were brought before South Africa’s courts. Speakers proposed that South Africa adopt patent opposition procedures to assist government in ensuring that only valid patents are granted. 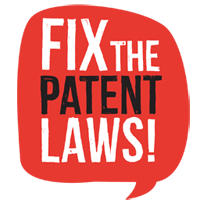 Such opposition procedures would allow third parties like generic manufacturers or civil society organisations to challenge the validity of patents without having to engage in expensive and time-consuming court procedures. South Africa can also set stricter standards of patentability to prevent the ‘evergreening’ of patent terms beyond 20 years. In her presentation, Leena Menghaney of MSF in India, responded to concerns raised about the financial and human resource requirements of implementing substantive patent examination by explaining how and why India set up such a system, and the benefits provided from the perspective of both public health and pharmaceutical industry development. Menghaney demonstrated that examination not only pays for itself through filing fees but can also generate significant revenue. For example, during 2009-2010, the Indian patent office generated revenue of Rs. 142.62 Crores (R230 million ZAR), while its expenditure (including design administration) amounted to Rs. 21.87 Crores (R35 million ZAR). Therefore, the revenue surplus during this period amounted to Rs. 120.75 Crores (R195 million ZAR). In developing its capacity to examine patents, South Africa could consider a phased approach to the introduction of examination. However, it is critical that the phased approach prioritises examination of pharmaceutical patents, given the immense impact of these patents on public interest. Beyond blocking access to medicines, the speakers challenged the claims made by industry that strict intellectual property protection stimulates innovation and development of new medicines. Sampat noted that the empirical evidence to support these claims is lacking. 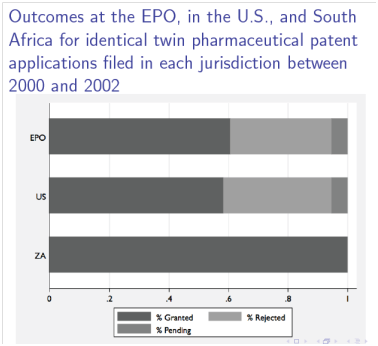 Additionally, Vawda showed that strict patent protection in South Africa is failing to stimulate local innovation, as fewer than 1% of pharmaceutical patents granted in 2008 were given to local inventors. Further, Menghaney showed that the massive growth of India’s pharmaceutical industry occurred in large part because the country refused patents on pharmaceutical products between 1970 and 2005. TAC and MSF welcome the commitment by the Department of Trade and Industry to submit the IP policy to Cabinet on 5 December with the aim to adopt a final policy, taking into account public comments, by April 2013. As part of this IP policy review, South Africa must adopt laws to remedy excessive patenting and abuse by pharmaceutical companies. As it currently stands South Africa’s legislation undermines health and is inconsistent with the Constitution. TAC and MSF therefore call on government to provide for full adoption of the TRIPS flexibilities to protect health.